3 Friends went to a shop and purchased 3 toys. Each person paid Rs.10 which is the cost of one toy. So, they paid Rs.30 i.e. total amount. Shop owner gave a discount of Rs.5 on the total purchase of 3 toys for Rs.30. Then, among Rs.5, Each person has taken Rs.1 and remaining Rs.2 given to the beggar beside the shop. Now, the effective amount paid by each person is Rs.9 and the amount given to beggar is Rs.2. 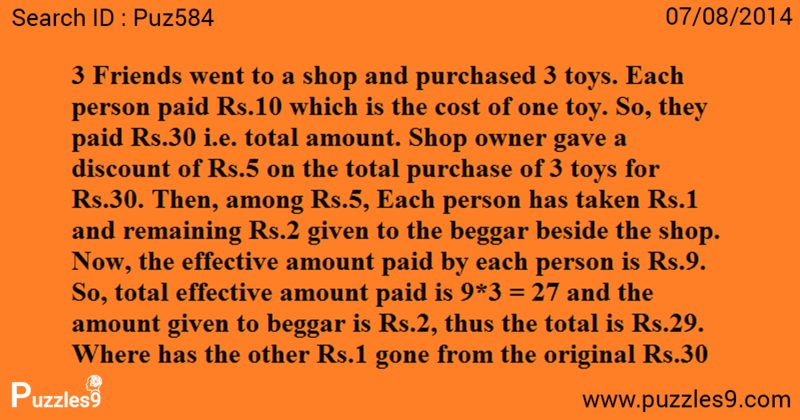 So, total effective amount paid is 9*3 = 27 and the amount given to beggar is Rs.2, thus the total is Rs.29. Where has the other Rs.1 gone from the original Rs.30 ????? The logic is payments should be equal to receipts. we cannot add amount paid by persons and amount given to beggar and compare it to Rs.30. The total amount paid is Rs.27. So, from Rs.27, shop owner received Rs.25 and beggar received Rs. 2. Thus, payments are equal to receipts.